The chart above shows an estimation of the Bitcoin hashrate distribution amongst the largest mining pools according to the Blockchain website. It might not be 100% accurate, but should give you a good idea about the situation and what are the trends. It is clearly visible that over 50% of the network hashrate is concentrated in four main pools – F2Pool, AntPool, BTCChina Pool and BW.com. 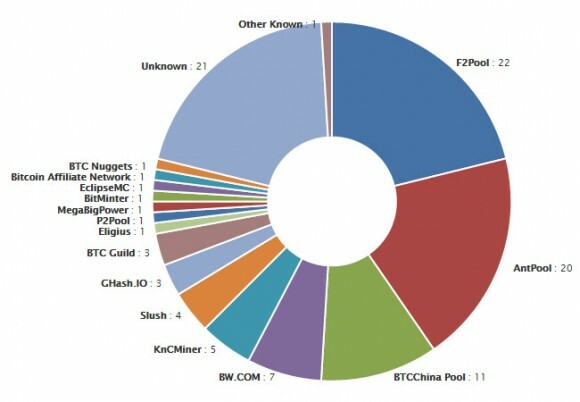 These are the largest Chinese pools and though some users from all around the world could be mining there as well, the reason for them having such big part of the total hashrate is most likely due to the fact that probably most large Asian-based mining operations are using them. The situation with previously quite big European or US-based mining pools is currently not so favorable and this is probably a direct result from the fact that home mining is getting less and less attractive for users and things are moving more to large scale industrial mining operations. We wan to to turn your attention to the KnCMiner mining pool that currently has about 5% of the total Bitcoin network hashrate and it apparently the fifth largest Bitcoin mining pool. it is important to note this fact as the pool is not open to anyone to mine in it, it is essentially a private mining pool where KnC is mining for themselves as the company no longer sells mining hardware to end users or other mining farms. KnCMiner is now a “Bitcoin transaction processing technology provider” instead of just Bitcoin ASIC manufacturer, and they have just recently announced their plans to build more datacenters and deploy their new 16nm ASIC chips. This means that KnC will continue to grow their capacity and their mining power especially now that they have probably the fastest and most efficient ASIC available only for themselves.